The easiest way to get your kids eating healthier is to take the things they are already familiar with and make them healthier. Rather than changing everything at once, start small and simple. For your next snack time, try these simple switches to getting your kids eating a more nutritious diet. We have all been guilty of sneaking healthy things into our kids’ meals to try to disguise the nutrition under the familiarity of their favorite foods. We have also all had those days where the fight to get the kids to eat healthily is just too much and we give in to what they want. But finding healthy alternatives to their favorite foods and making the healthy foods fun is key to getting them to eat nutritious meals without all the hassle. The easiest way to start healthy habits is with snack time. Rather than springing a very different meal on your kids at an important part of the day, subtly switching things over can be easier. This gives you and your children less stress to have it eaten and can make it much easier to start the healthy trend. The easiest way to get your kids eating healthier is to take the things they are already familiar with and make them healthier. Rather than changing everything at once, start small and simple. If your kids are anything like mine, they will recognize the shapes and be willing to try it. But if you tell them what is in it before they try it, it is hopeless. So for your next snack time, try these simple switches to getting your kids eating a more nutritious diet. Kids love French fries, that is just a fact. The shapes are easy to handle and they taste amazing, which is undoubtedly why you will see a plate of them around kids in restaurants. So switching out the regular potatoes with a sweet potato alternative can be a great way to get them eating healthier without having to completely forgo the French fries. Sweet potatoes are filling, but they also filled with nutrients that the regular potato does not have like Vitamin A, folate, and B6. This makes them the better alternative. Muffins don’t always have to be a sugar-filled mini cake. Sometimes you can create amazing tasting muffins that will also be healthy and your kids will want to eat. This includes pumpkin muffins with whole oats, carrots, and absolutely no flour or added sugar. You can add other things like berries or try different flavors, but there are plenty of healthy muffin recipes out there that the kiddos will really love. 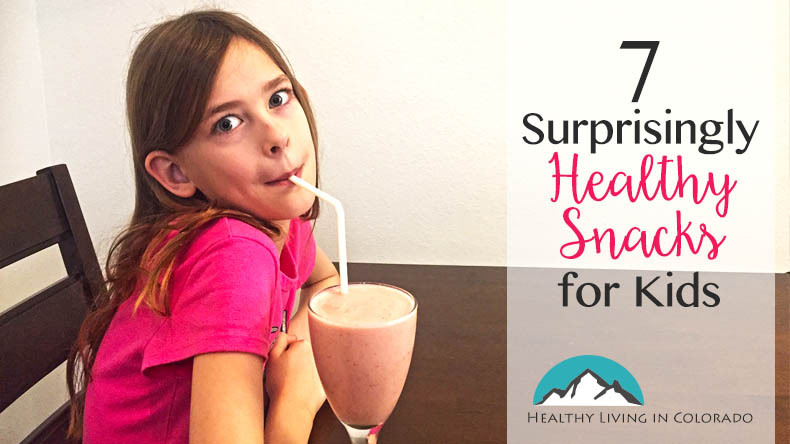 Smoothies are not only simple to make, but also easy to customize to the kid’s preferences without having to skip on the healthy aspects. Add the fruits and vegetables of your choice to the mixture and mask that with a little juice and yogurt to make it taste more like their favorite juice but with less sugar and more nutritional benefits. It is amazing how much a stick makes a difference to a child’s food. Simply buy a pack of barbeque sticks/skewers and place the food onto it. (Just make sure your child is old enough to not get hurt with it.) While we might see kabobs as an inconvenience, children see a wand of food they can enjoy eating. You can do cheese and fruit pairings, include veggies, and even cut up their sandwiches and put it on a stick to make it more interesting to them. Rather than buying ice pops from the supermarket, you can make your own! This can be a nice way to bond with your children and create a fun activity in the summertime to make your own. As parents, we get to control what goes into the ice pops to guarantee they stay healthy, but your kids also get to enjoy creating their snack and reaping the delicious benefits on the hot summer days. The classic go-to snack for every kid, the peanut butter and jelly sandwich is a great option for on the go parents. And we don’t have to worry about settling for an unhealthy snack. Peanut butter is a fantastic source of protein and good fats and going with wheat bread will give your child extra fiber in their diet. Just don’t go too heavy on the jelly and opt for healthier options like naturally sweetened jams. Didn’t think you would see cookies on this list did you? But the cookies I’m talking about are very different than the standard bake sale cookies you have in mind. These cookies may look like their unhealthy counterparts, but they are made of very simple ingredients. This includes mashed bananas, whole oats, oil and whatever you want to flavor it with if you so choose and simply baking the mixture for 375 degrees F for 15 to 20 minutes. Getting your children to eat healthily is no easy feat sometimes. Between being picky eaters and sticking to their guns, you can’t make them eat anything they are dead set against. So finding ways to get them to eat healthily is important. 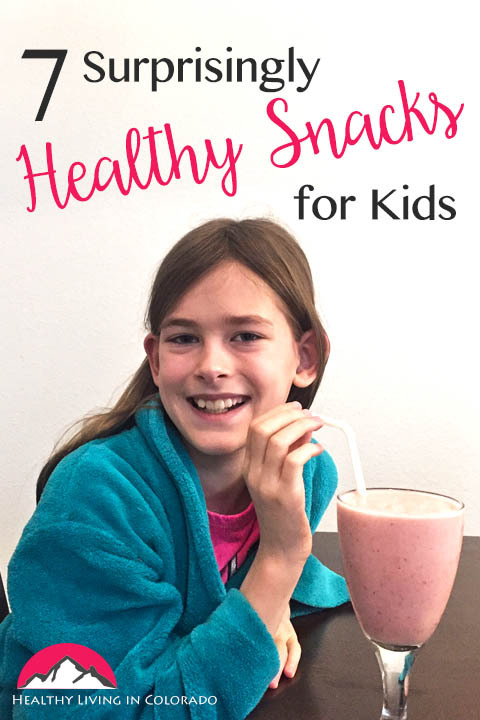 If you are like me and want to instill good eating habits in your children that will last a lifetime, it is important to get creative and make it work. Start small with snack time and enjoy seeing your kids enjoy nutritious foods and see the difference it makes. A great article, 8 Tips for Raising Healthy Eaters, may be helpful for you, too. For other healthy snack ideas delivered straight to your home, Thrive Market has an amazing selection at good prices! You may also like these other posts from Healthy Living in Colorado: How to Express Love to Your Child or How to Help Others Get Along Using DISC Inventory. Mandy is the founder of Motherhood Lifestyle blog, Make Me Up Mandy. As a mom of 4, she keeps busy with coming up with nutritious meals while running her online business. 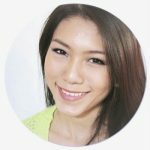 You can also follow her on Facebook! I love the fruit wand idea! I hadn’t thought about it like that before. Yes, it is so much fun for kids! Glad you liked it. These are all good ideas that would be good alternatives for junk food. My kids are so hungry when they get home, it is hard to find something that will fill them up fast that is also healthy. I’ll have to use some of these ideas. I know! Kids can be a bit difficult to please sometimes. I hope these tricks help them stay healthier! When my kids were younger, I used to sneak all sorts of stuff into smoothies and muffins. My daughter is much better about trying new things and eating fruits and veggies. My son, well, let’s just say last night I was picking lettuce out of his dinner. These are all great ideas to share with parents. Ice pops! I forget about those over the winter but they’re so handy to have on hand in the summer. I had a really neat set of molds right before we moved – I need to go dig those out before the weather gets hot. Thanks for the reminder! Oh, good! I need to find my molds, too. Thank you for the reminder, haha! These are great! I feel like we have about three snacks a day between all of our meals….and the summer is generally worse 🙂 These are some really nice ideas to incorporate so it’s not always an empty snack. That’s good! Thanks for the comment! With #5 on the way, I’m always looking for ideas for the kids because they are to ALWAYS be hungry!! Thanks for these suggestions! Snack tips are always handy, sometimes I feel I am out of any inspiration. Recently I just made apple slices with peanut butter on it and they were a hit! It’s an ongoing process of trying and exploration. Apples and peanut butter is a good one! I’ll have to add that to my rotation. Oh these are such great ideas! Thanks for sharing! I was literally JUST saying that I want to make some homemade popsicles! I need to remix some recipes and cater to my son’s feature for treats all of the time now with healthy options like these!! Oh, good. I hope he likes them!